A Franco-Belgian production adapted from the novel of the same name by Jean-Patrick Manchette and Jean-Pierre Bastid, Let the Corpses Tan is a heavily stylised kaleidoscope of unflinching violence supported by a bravura visual palette that employs all kinds of cinematic trickery to tell its tale of intrigue and betrayal and the legacy of the Golden Woman (Löwensohn’s Madame Luce, albeit in younger days). It’s an absurdist Euro-meta-Western, straight out of the late Sixties and early Seventies, and with compositions by Ennio Morricone from the period that fit neatly into Cattet and Forzani’s excessively mounted pastiche. Replete with every trick in the book to add energy and pizzazz to its flamboyant tale, the movie is exhausting to watch, with the camerawork and the editing designed in tandem to assault the eyes and render any resistance as futile. 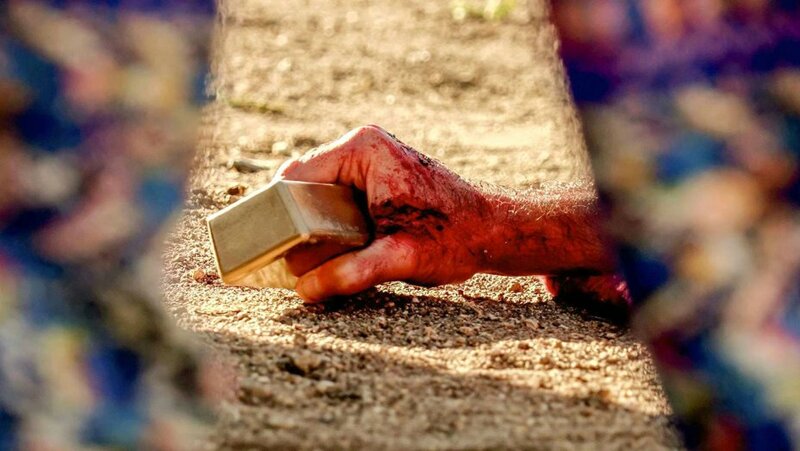 This is a movie that wants to dominate its audience into submission, to send it reeling away at the movie’s end having been visually assaulted by the extent of Cattet and Forzani’s colour drenched aesthetic. But while it does have an excess of, well… excess, Let the Corpses Tan doesn’t quite reach the giddy heights it sets for itself, and for all the visual distractions, its basic premise lacks conviction. It’s nearly always the same: the more striking a movie is to look at, and the more its creators rely on creating an overly stylised mise en scene, the more likely it is that the story isn’t on the same level. Here this is unfortunately the case, as Cattet and Forzani (who also wrote the screenplay) forget to make any of the characters relatable or sympathetic, and though you could argue that this might be deliberate, when you don’t even care who gets out alive – or at all – then an opportunity has been missed. Such is the case with a movie where the expected body count happens at regular enough intervals but without any of them making an impact or eliciting an emotional response in the viewer. It’s rote storytelling, with the original source material diluted and weakened by the visual artifice it’s asked to support. The cast struggle too, with Löwensohn behaving as if Madame Luce is still tripping from the Seventies, while the male characters are pretty much indistinguishable from each other. And by the end even the violence has become tiresome. There’s a better movie hidden somewhere inside Cattet and Forzani’s screenplay, but in allowing themselves free rein with the movie’s look, that particular version was always doomed to stay hidden. Rating: 6/10 – though visually adventurous and on occasion quite audacious – a fantasy sequence where the nanny’s clothes are ripped to shreds by gunfire leaving her naked is a prime example – nevertheless Let the Corpses Tan is only partly successful; a movie with style in (over-)abundance, but without the necessary substance to back it up, this can be enjoyed on a basic level, but those looking for more than just visual panache would do better to look elsewhere. In Seraing, a small Belgian industrial town, Sandra (Cotillard) works at a solar panel factory. The workforce consists of seventeen people, but Sandra has recently been off sick due to a bout of depression. During her absence, her boss, Monsieur Dumont (Sornin) has realised that the work can be done just as well by sixteen people instead of seventeen. As a result, she has fallen foul of machinations orchestrated by her foreman, Jean-Marc (Gourmet), and Dumont has given the rest of the staff a choice: they can have a €1000 bonus or keep Sandra in her job. Thanks to Jean-Marc’s scare tactics and bullying, the staff have voted for the bonus. Sandra has all but given up on her job when her co-worker Juliette (Salée) calls to say Dumont has agreed to meet with them. He agrees to a secret ballot, to be held on the Monday morning (it’s currently Friday afternoon). All Sandra has to do is visit the rest of her colleagues over the weekend, explain about Jean-Marc’s role in things, and ask if they will vote for her to keep her job at the secret ballot. But Sandra hasn’t fully recovered from her illness, and her confidence is at such a low that she just wants to curl up in bed and ignore everything going on around her. Urged on by her husband, Manu (Rongione), and furnished with a list of addresses by Juliette, she sets out on Saturday morning by public transport to persuade her colleagues to vote for her. Some agree readily, others inform her that the money will ease their own problems. She manages to change the minds of a few, but by the end of the day she’s only halfway to getting the numbers she needs. Driven round by her husband, she continues on Sunday but although she makes further headway, by the afternoon the whole thing begins to look even bleaker when she suffers a setback. Filled with despair, she takes a whole bottle of Xanax but when a colleague changes her mind and visits Sandra to tell her, her hope returns. With the pills flushed out of her system at the hospital, Sandra resumes her visits to her remaining colleagues. But by the time of the secret ballot on Monday morning, it’s too close to call and she has an agonising wait to hear the result. 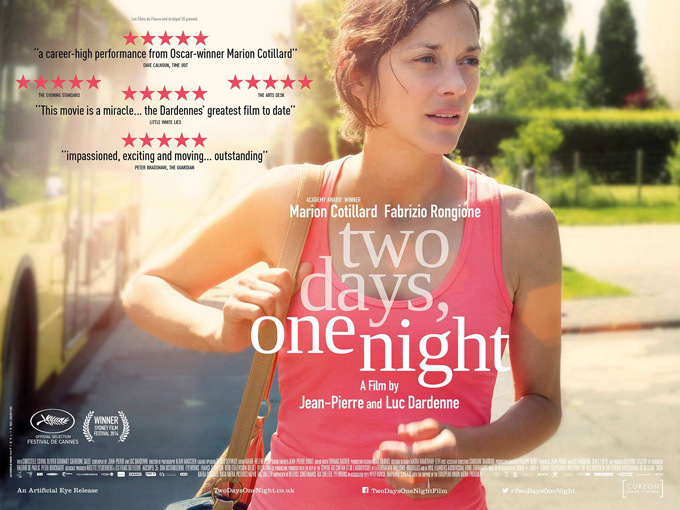 The latest from the Dardenne Brothers, after their wonderfully simple and affecting The Kid With a Bike (2011), Two Days, One Night is another simply told, emotionally honest drama that features a strong central performance, and tells its story with a minimum of artifice and a maximum amount of intelligence. Its tale of a woman fighting to retain both her job and what little self-confidence she’s managed to keep following her illness, Two Days, One Night takes a straightforward storyline and imbues it with such emotional depth, and makes such an impact, that it lingers in the memory long after it’s ended. This is due in no small part to Cotillard’s superb portrayal of Sandra, a role that she inhabits so completely and so effortlessly that if you started watching the movie from just two minutes in, you could be forgiven for thinking you were watching a documentary. As the movie progresses, Cotillard’s beautifully shows the depth of despair and terror that Sandra is feeling about her situation, and the way in which she clings to each small victory with undeniable relief. By the time Monday morning arrives, she’s still nervous and she’s still unsure how the vote will go, but she’s gained so much confidence in herself, and so much more courage than she had on the Friday that you’re praying the ballot will go her way. Cotillard gives such a brilliant performance that it’s a testament to the abilities of the Dardenne Brothers that she doesn’t dominate the movie to the point where the other characters and their stories are overwhelmed. Each of her colleagues has their own story to tell and each is indelibly presented, with special mention going to Cornil as a woman with an abusive husband (and who tips the balance when Sandra takes her overdose), and Magomedgadzhiev as a male colleague who doesn’t react in anything like the way Sandra expects when she catches up with him. The Dardennes show a clear appreciation for the rhythms and symmetries of daily life, with Sandra’s home and family life and their importance for her naturally presented. It’s contrasted with the homes of her colleagues, none of which she sees except from the doorstep. Even when someone is home she’s never invited inside, as if she were an outsider, and this unspoken rejection adds to Sandra’s struggle, as she has to go further almost every time in tracking someone down (at one point she bumps into one of her colleagues by accident). It all adds to her sense of impending failure and shows just how difficult such a simple “exercise” can become when so much rides on it. The Dardennes capture every high and low of Sandra’s journey and by setting it in such a familiar, provincial environment, they reinforce how perilous ordinary life can be when something unexpected happens. Alain Marcoen’s exquisite photography breathes added life into the movie’s mise en scène, and is complemented and enhanced by Marie-Hélène Dozo’s confident, precise editing (some scenes were filmed in a single take, adding to the verisimilitude). With the Dardenne Brothers free to weave their magic on the material, the movie becomes a spirited, uplifting look at one woman’s dark journey to personal redemption. Rating: 9/10 – a quietly effective, quietly rousing tale of an underdog finding strength in the unlikeliest of circumstances, Two Days, One Night is a triumph for the Dardennes and a delight for the viewer; Cotillard is superb, and confirms her place as one of the finest actresses working in movies today (as if we needed reminding).